US envoy Stephen Biegun will visit Moscow this week ahead of a planned summit between Russian President Vladimir Putin and North Korean leader Kim Jong-un, which could take place as soon as next week. Biegun, special representative for North Korea, will meet with Russian officials Wednesday and Thursday to discuss efforts to advance the final, fully verified denuclearization of North Korea, the US State Department said in a statement Tuesday. Biegun’s Moscow visit comes on the heels of the Kremlin’s confirmation that a meeting between Putin and Kim was being planned. 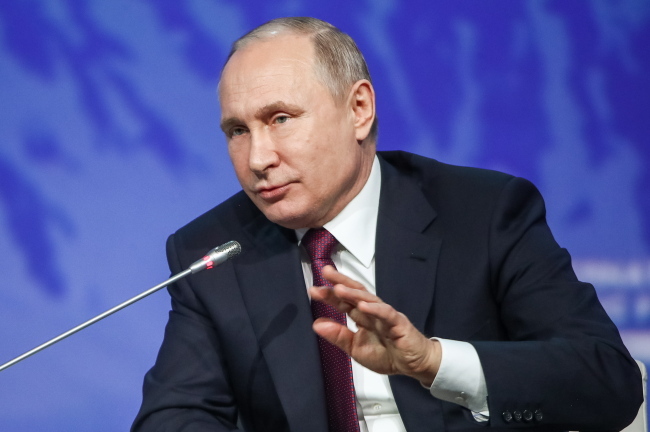 While the date of the summit has yet to be announced, news reports speculated that Putin would meet Kim before traveling to Beijing for an international forum. The “One Belt, One Road” forum is scheduled for April 26-27. Media outlets here reported Wednesday that a Vladivostok-bound flight from Pyongyang has appeared on the timetable of the Russian city’s international airport for April 23, which seems to be deployed in preparation for a Putin-Kim summit. An Air Koryo flight is scheduled to land at the Vladivostok International Airport on Tuesday, April 23 at 11:50 a.m., an unusual date for the North Korean airline that normally operates flights only twice a week, on Mondays and Fridays. Prior to a possible first summit with the Russian leader, Kim called for a bold and flexible decision from the US, while giving the deadline of the end of the year. “It is essential for the US to quit its current calculation method and approach us with a new one,” he said in a speech to the Supreme People’s Assembly on Friday. Analysts said that Biegun’s Moscow visit aims to call on the Kremlin to fully enforce UN sanctions on North Korea -- Washington’s key negotiating leverage over the nuclear weapons program. “The US will try to make sure that Russia complies with the framework of sanctions when it pursues cooperation with North Korea,” said Shin Beom-chul, a senior director at the Asan Institute for Policy Studies. He downplayed the possibility that Russia would play a greater role in the denuclearization talks, saying North Korea wants to show the US it has options to pursue “a new way.” During his New Year’s Day address, Kim warned that he would seek a new way if the US maintains its sanctions pressure and unilateral demands. “The size of North Korea’s economic cooperation with Russia falls far short of that of China’s. Plus Russia’s priorities lie within Europe, not North Korea,” Shin said. The UN Security Council sanctions committee’s updated report on North Korea showed Wednesday that the volume of Moscow’s exports for the supply, sale or transfer of all refined petroleum products to Pyongyang surged in the first two months of this year compared to the same period a year ago. Russia’s combined refined petroleum exports to Pyongyang in January and February stood at 10,358 tons, compared to 2,250 tons in 2018. The UN limits North Korean petroleum imports to 500,000 barrels per year.